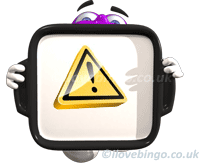 Please read: i-love-bingo.co.uk strongly condemn operators with unethical behaviours and operators who do not respect their obligations towards their partners or suppliers. Gala Bingo, Coral and Ladbrokes, have recently modified their partners affiliate program with very little notice and close our accounts with no prior warning. They will no longer honour their contract and pay us our due fees. We have decided not to direct our users to their site(s) as we strongly feel that their unethical conduct, behaviour and disrespect for their own partners might be repeated to their players. The risks to our players are therefore too high for us to recommend their links. When clicking on the button "play now" Users will be re-directed to another bingo brand operated by the same software and providing a wider range of products, better ethos, and respect for agreement and T&Cs. The safety and security of our players online activities is paramount. We at i-love-bingo.co.uk pride ourselves on providing impartial and fair reviews of all bingo sites available to UK online bingo players. We pride ourselves on our impartiality and on being able to provide clear and accurate assessments for the benefit of the online bingo playing public. “Unfortunately we are no longer in a position to endorse Gala Bingo, Coral and Ladbrokes"
Unfortunately we are no longer in a position to endorse Gala Bingo, Coral and Ladbrokes. In withdrawing our support for these sites we make it clear that we do so solely as a result of our business relationship with Gala Bingo, Coral and Ladbrokes and that the business and commercial confidence in our relationship has been undermined by them as a result of certain actions which they have recently taken. The purpose of making this statement for our readers is simply to apprise them of the situation and express the position which our company has unfortunately been forced into taking. Nothing contained in the above should be considered as being anything other than a factual statement of events. Gala is one of the oldest and largest UK based bingo specialist company. The s[ecialised brand used to develop, run and operate their own games and products but have recently (2011) made an agreement with Virtue Fusion and GTS (Playtech) to take over and solely operate the entire online portfolio.